After my Cornerstone class on technology and complicity I followed up with a second class, a conversation relating technology to social activism. Our discussion centered on a recent article by Malcolm Gladwell in The New Yorker entitled Small Change: Why the Revolution Will Not be Tweeted. In the article Gladwell pushes back on the hype that Web 2.0--mobile social computing such as texting, Facebook and Twitter--will be the next big leap in social activism. 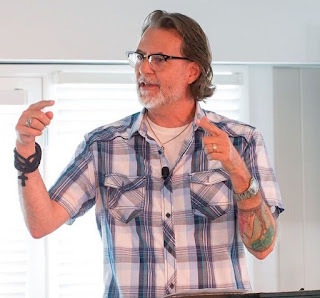 With its power to connect like-minded individuals, Web 2.0 has this seemingly unlimited power to increase social and moral awareness and to link up people who want to make a difference in the world. This was vividly on display during the Green Revolution in Iran, when the youth of Iran took to the streets to protest the outcome of the 2009 Iranian election. While the Iranian state controlled most of the media and communication outlets they had not anticipated how Web 2.0 would allow the protesters to communicate and organize. Much of this organization occurred via Twitter. In fact, in the middle of the revolution the US State Department asked Twitter to hold off on a scheduled maintenance that would take Twitter down. It was feared that if Twitter went down during the Green protests the activists would have trouble coordinating. Twitter agreed to this request and left the site up. Subsequently, some have suggested that Twitter should have been nominated for the Noble Peace prize. In light of this, it is not surprising that the Twitter Revolution in Iran has inspired hopes that social activism might be entering a Golden Age. With the support of Web 2.0 connecting activists both locally and globally we seem poised, finally, to change the world for the better. But Gladwell begs to differ. Specifically, he cites critics who point out that Twitter did not play as large a role as we think it did during the Green Revolution. But Gladwell's argument goes deeper, as it is less a revisionist history of the Iranian protests than an examination of the strengths and weakness of Web 2.0 and how these relate to social activism. The crux of Gladwell's argument is this: Web 2.0 specializes in weak ties. Consequently, Web 2.0 is wonderful at doing what weak ties do: Socially connecting diverse groups of people. This is the "strength" of weak ties. However, according to Gladwell, social activism is inherently a strong tie phenomenon. Consequently, Web 2.0 seems ill suited for the kind of tough, committed activism that will change a world that stubbornly clings to an unjust status quo. But it gets worse. Gladwell's argument, as I read it, isn't simply the observation that Web 2.0 is ill suited for social activism. The real worry is that Web 2.0 creates an illusion of activism. That is, real world activism is being traded in for a virtual activism. And the dual meanings of the word "virtual" are in play here: An online activism that is, at root, unreal, a mere simulation of activism. Web 2.0 creates the illusion that you are "doing something" when, in fact, you are not. In this view, Web 2.0 might not be the Golden Age of Activism. It might, in fact, herald the beginning of the Dark Ages. To understand this argument it might be helpful to review a bit of the sociological literature regarding strong and weak ties. Specifically, what are weak ties--and Web 2.0--good for? And how might the strength of weak ties be, in the case of social activism, a form of weakness? 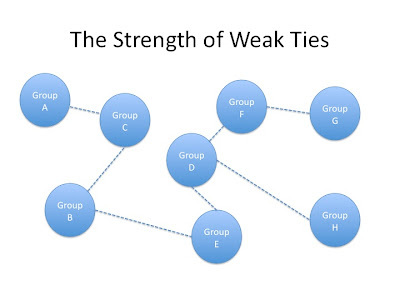 The seminal work in pointing out the surprising power of weak ties was Mark Granovetter's 1973 article The Strength of Weak Ties. 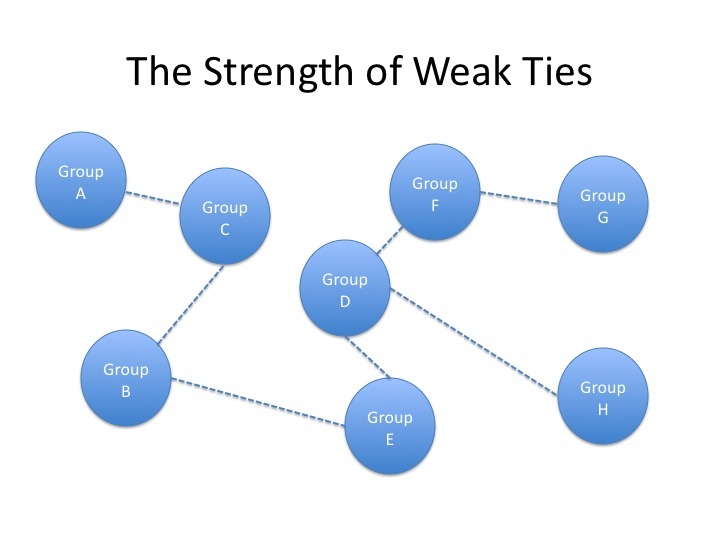 To understand Granovetter's analysis (and Gladwell's criticism of Web 2.0 social activism) we need to distinguish between strong and weak ties. A strong tie is generally an intimate or family relation, a person you know very well: Think of your close network of friends. A weak tie is an acquaintance, the people you know only in passing at church or at work or in your community. Basically, strong ties are friendships and weak ties are acquaintances. Relationally speaking, we think of friendships as "strong" (intimate) and acquaintances as "weak"(less intimate). But Granovetter's article is entitled the "strength of weak ties." And it leads us to ask, What is so strong about weak ties? To understand the strength of weak ties we need to grasp two basic ideas about how relationships form in the social world. Imagine three people, Alice, Betty and Candy. 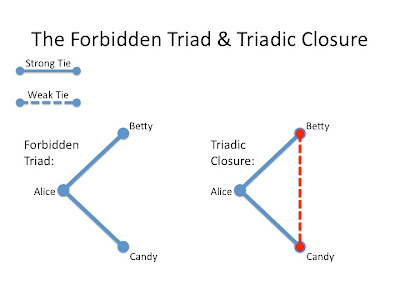 We can think of Alice, Betty and Candy as three points on a triangle. To start, we can imagine Alice, Betty and Candy as mere acquaintances. That is, they are each joined by weak ties. We can also imagine Alice, Betty and Candy as close friends, all three joined together by strong ties. Finally, we can imagine a mix of relationships between the women. Perhaps Alice and Betty are good friends and Candy is an acquaintance of Alice's. All this may sound a bit technical, but the dynamic here is very mundane and commonsensical. Alice is good friends with both Betty and Candy. But, initially, Betty and Candy don't know each other. But as time goes on they will learn of each other. Alice will talk about Candy to Betty and about Betty to Candy. Eventually, Alice might want to go to a movie or out to lunch. So she invites her two good friends, Betty and Candy. The point is, over time, because of the mutual strong association with Alice, Betty and Candy will, at the very least, become acquaintances (i.e., share a weak tie). The triangle closes. 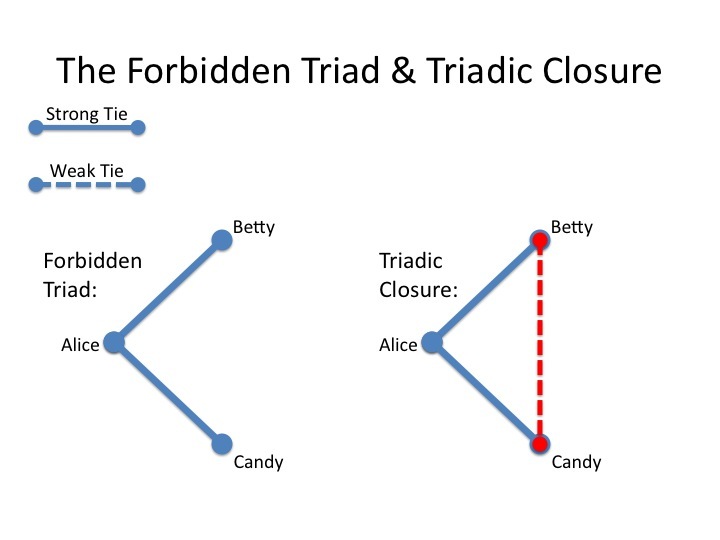 Now, what is important to note in all this is that triadic closure only occurs if there are preexisting strong ties. 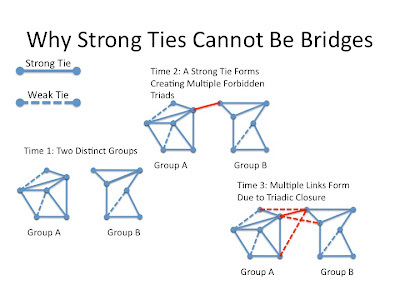 If three people are bound by weak ties no closure will, necessarily, occur. That is, I can't be expected to bring two of my acquaintances together, but I can be expected to make two of my good friends share at least some time together, if only as I share stories about them with each other. With these ideas in mind we are now prepared to understand the unique strength of weak ties. Imagine two groups of friends, call them Group A and Group B. Initially, at Time 1, these groups are separate, sharing no weak or strong relationships. Consequently, the groups are isolated from each other, socially speaking. The point of the above diagram is that when strong ties connect groups multiple connections begin to emerge merging the two previously isolated groups. We are now ready to appreciate the big point of Granovetter's paper. 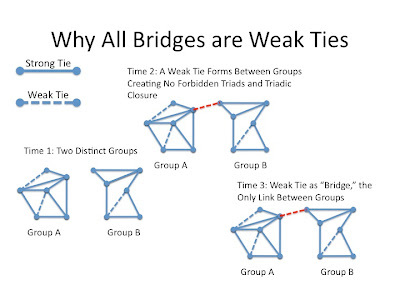 Specifically, as illustrated in the two diagrams above, only weak ties can serve as bridges. This is the strength of weak ties. 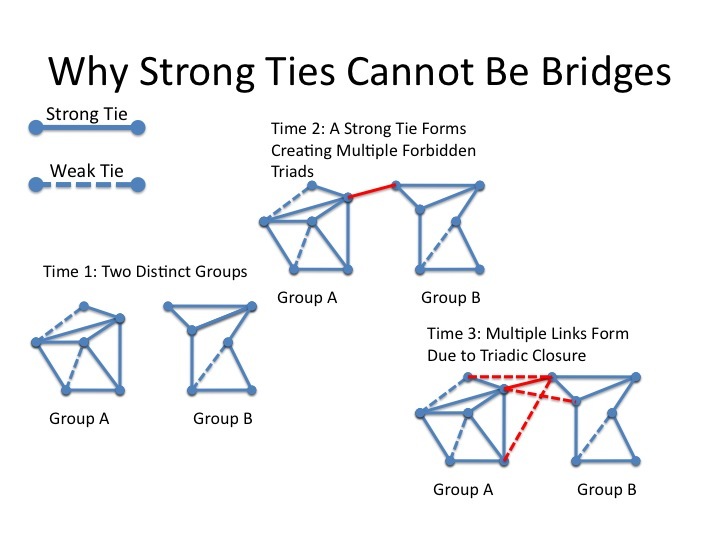 Weak ties are precious as they represent the only social connection between two isolated groups. 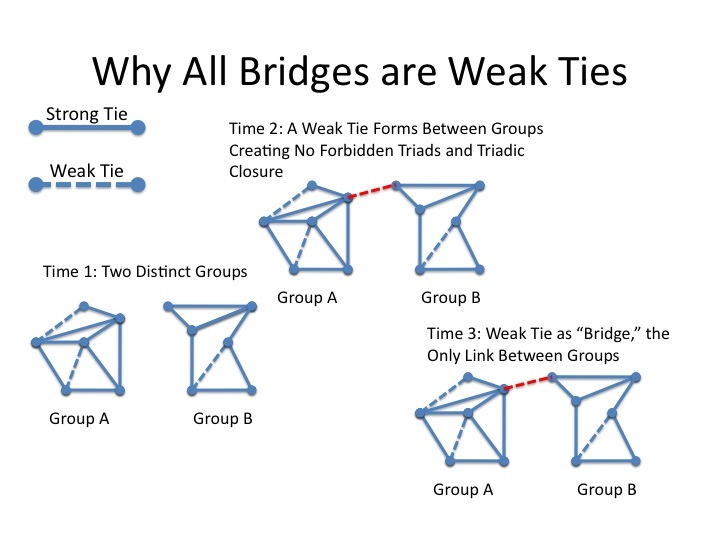 But what is so special about these weak tie bridges, these thin filaments of association between social groups? Well, there are times in life when we need to make contact with the wider world, the world outside of our tight network of friends. While friendships are strong, they tend to be poor at connecting you with those outside your sphere of influence. Why? Well, due to triadic closure friendship groups tend to know all the same people. These groups tend to be insular and cliquish. Of course, there is value to this insularity if you are looking for social support, but it's a weakness if what you are needing is social search. So when you are job searching, sniffing out these weak tie contacts is critical to getting social information outside of your social sphere. In short, where strong ties are deep weak ties are broad, they help us leap across the social world very quickly and efficiently. That is the strength of weak ties: Connectivity. The platforms of social media are built around weak ties. Twitter is a way of following (or being followed by) people you may never have met. Facebook is a tool for efficiently managing your acquaintances, for keeping up with the people you would not otherwise be able to stay in touch with. That’s why you can have a thousand “friends” on Facebook, as you never could in real life. This is in many ways a wonderful thing. There is strength in weak ties, as the sociologist Mark Granovetter has observed. Our acquaintances—not our friends—are our greatest source of new ideas and information. The Internet lets us exploit the power of these kinds of distant connections with marvellous efficiency. It’s terrific at the diffusion of innovation, interdisciplinary collaboration, seamlessly matching up buyers and sellers, and the logistical functions of the dating world. But weak ties seldom lead to high-risk activism. In short, Gladwell wonders if Web 2.0 activism can create social bonds strong enough to create the next Civil Rights movement. If Web 2.0 specializes in the weak tie something more will be needed to change the world if social activism is, indeed, a strong tie phenomenon. But it gets worse. It's not just that Web 2.0 is ineffectual from a social activism standpoint. No, what is most worrisome is that Web 2.0 can create an illusion of activism. Tricking us into thinking, via all our online activity, that we are changing the world when, in fact, we're doing very little by way of challenging the power structures of the world. A Facebook or blog rant about poverty might soothe my conscience but it does very little to help the poor. In short, Web 2.0 might be a sponge that soaks up our dissent, defusing and dissipating our moral anger and energy. Dissent goes virtual in the worst way and becomes a cyber-induced illusion. It's the Matrix keeping us morally asleep. I'm interested in Gladwell's analysis for a couple of reasons. 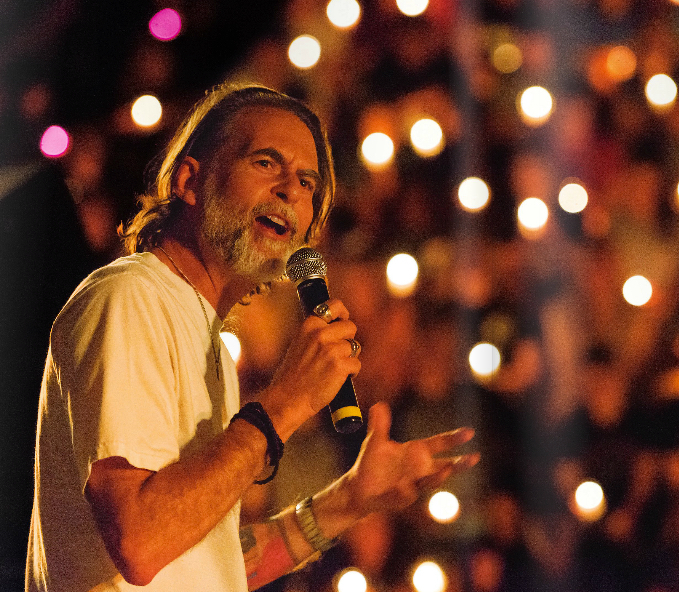 First, I work at a Christian university where our motto is "Change the World." More, ACU is deep into a mobile learning initiative where all incoming students are given iPhones. As a part of this initiative we talk a lot about mobile devices and push students into the world of Web 2.0. So if Gladwell is even partly right we should have some worries on our campus. Specifically, it seems obvious, to me at least, that students on our campus would connect their social activism ("Change the World") with Web 2.0 (due to all those iPhones we've handed out). And this connection might not be a good thing. Is it possible at all those iPhones are soaking up and dissipating the dissent and moral outrage of our students? The second reason I'm interested in Gladwell's analysis has to do with church, as hinted at in the title of this post. Awhile back I wrote a post entitled How Facebook Killed the Church which stirred up some controversy on the Internet. The heart of that analysis was similar to Gladwell's argument. Basically, I argued that, for the majority of people, church is a weak tie organization. True, the core of any church is based upon a tight network of strong tie associations. But that core is, what, 20% per the 80/20 rule? For the remaining 80% church is often like Facebook, a handful of weak tie connections. If this is true, the rise of Web 2.0 is going to hurt the church. In the era of Facebook one doesn't need the church to help with weak tie connections. You can do that online. A lot of readers misinterpreted that last line. They thought I was excited about the death of the church. What I was actually suggesting was that it might be a good thing to kill off the Facebookish facet of church. The death of a weak tie church might not be something to lament. In fact, when we look at the mega-church isn't that what we are looking at, a church that has gone in for the weak tie over the strong tie? Size over depth? Isn't the mega-church the ecclesial equivalent of having thousands of Facebook friends? Another way of saying this is that discipleship isn't a weak tie phenomenon. Church, like social activism, is about strong ties. And I'd like to think the two are related. So I agree with Gladwell. The Kingdom of God will not be Tweeted. But if prayer is part of my strong-tie relationship with God (assuming He exists), and God is in a strong-tie relationship with the world he made, prayer should, perhaps cause at least the weak-tie between me and his world. Maybe the danger you describe is when people who pray don't have a strong-tie with God? Thanks for a thoughtful post, Richard. I think the beauty of Granovetter's research is that it counters our tendency to think that only strong ties matter. In reality, we need strong ties and weak ties, and we pursue both in all walks of life including church and Facebook. A church of primarily strong ties will quickly grow insular, and it will have little impact on the world around it. And Facebook may reinforce strong ties with close friends and family while it enables the maintenance of weak ties with high school classmates. Yes, we can delude ourselves into thinking we are accomplishing more than we are, but the effects of technologies are always dependent on how we actually use them. I challenge my students with the opportunity they have to use Web 2.0 in ways that help others. Thanks again for sharing this.